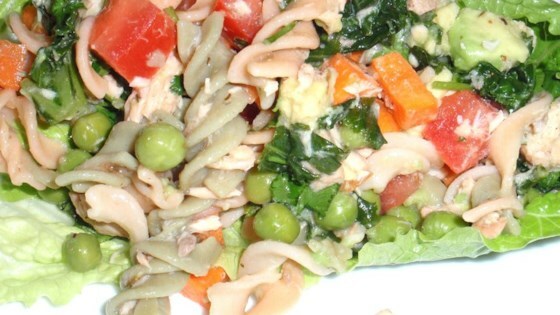 "This is a unique twist using brown rice pasta instead of ordinary wheat. This brightly colored tasty salad has wild Alaskan salmon, cherry tomatoes, avocado, fresh spinach, and a variety of other veggies. It is so easy to make. Chill in fridge and then serve!!!" Fill a large pot with lightly salted water and bring to a rolling boil. Stir in pasta, and return to a boil. Cook pasta uncovered, stirring occasionally, until it has cooked through, but is still firm to the bite, 10 to 12 minutes. Drop frozen peas and spinach into boiling pasta during the last minute of cooking. Drain pasta, peas, and spinach in a colander. Return pasta, peas, and spinach to the pot. Stir in salmon and salad dressing until well combined. Chill in the refrigerator, about 20 minutes. Gently stir in carrots, tomatoes, cilantro, avocado, and lemon juice. I added extra vegetables, using kale instead of spinach, and chopped tomatoes rather than cherry tomatoes. This is a great tasting salad.